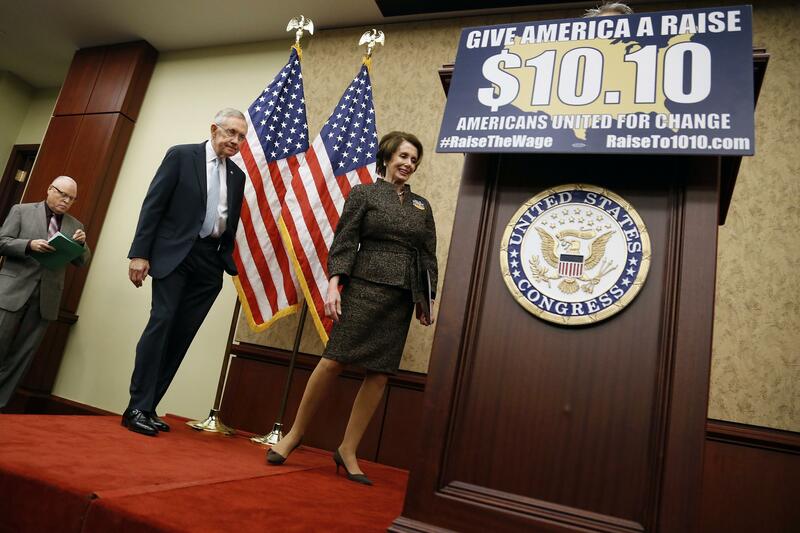 Senate Majority Leader Harry Reid, D-Nev., has spent months setting up a vote on a bill to raise the minimum wage to $10.10 an hour, but the legislation is expected to meet its end in a matter of minutes Wednesday. With staunch Republican opposition to the policy - not to mention the belief that Democrats are using the issue as an election-year gimmick - Reid won't be able to muster the GOP votes he would need to get the bill on the floor for debate. The majority leader had hoped to bring the proposal up for a vote earlier this year but it has been delayed by the gridlock facing the Senate on other issues, including judicial nominations and an extension of emergency unemployment benefits that took months to pass. Reid would need at least six Republicans to overcome a filibuster and bring the minimum wage vote up for debate on the floor. One Democrat facing a tough re-election bid, Arkansas Sen. Mark Pryor, had said the increase was too much, too fast and would have voted no. He will also miss Wednesday's vote to attend to tornado damage in his home state. Other Democrats who hail from Republican-leaning states were also unsure. But even potential Republican supporters have been put off by Reid's insistence that the wage be raised to no less than $10.10, the amount a person would have to earn each hour in a 40-hour work week to be above the poverty line. Sen. Susan Collins, R-Maine, was one of those lawmakers. She was reportedly talking to colleagues about a smaller increase in the minimum wage, but with no indication that she would be able to offer an amendment to the Democratic plan, she told a reporter Tuesday that she expected to vote against the measure. Reid predicted Tuesday morning that opponents wouldn't even bother saying much about the bill, "because the republicans are not anxious to come here and speak against raising the minimum wage." But there are Republicans who were more than willing to accuse Reid of seeking only to score political points. "With more than 10 million Americans unemployed, the last thing that this body should be doing is considering legislation that would jeopardize jobs. Yet this week we're back in session with another one of the Democrats' election-year gimmicks," Sen. John Thune, R-S.D., a member of the Senate Republican leadership, said. At the heart of the Republican opposition is a belief that raising the minimum wage would have an adverse effect on low-wage workers by leading employers to cut jobs. They cite a study from the Congressional Budget Office that said raising the minimum wage could cost 500,000 jobs (though it would also raise wages for an estimated 16.5 million people). Sen. Tom Harkin, D-Iowa, the author of the minimum wage bill, said the bill would help 28 million people -- a figure his office says includes people both directly and indirectly impacted -- more than half of whom would be women, and more than 7 million of whom are parents. And it's unlikely, even with the legislation halted, the Democrats will stop championing the minimum wage as part of an election-year message that aims to show them as the party that champions working-class Americans. President Obama will speak on the importance of raising the minimum wage at the White House Wednesday. In the House, Democrats are attempting to force a vote on a companion bill to Harkin's although it, too, is all but certain not to succeed given Republican control of that chamber.